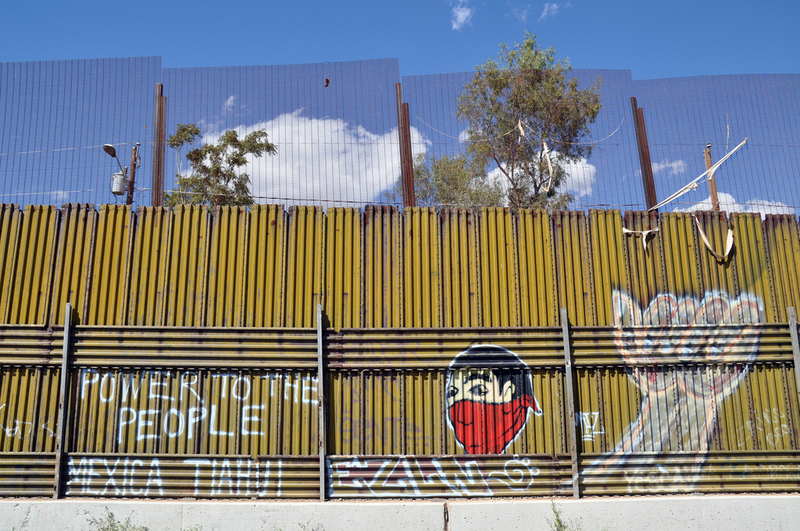 Immigration, the Drug War and Big Pharma: Where’s the Outrage? Here are three stories that have been in the news recently. The corporate media have presented them as unrelated; nothing could be further from the truth . An article in the New Yorker details how the Sackler family’s privately owned Purdue Pharma was a major force in creating the current opioid epidemic, thanks to deceptive marketing and a suspiciously cozy relation with the FDA. The multibillionaire family also played a role in promoting the overuse of Valium and Librium starting in the 1960s. Purdue has had to pay some fines and a few of its officers have been punished with brief probation periods, but these are slaps on the wrist considering the billions the Sacklers have raked in over the years. Until recently the family’s members have been best known for their philanthropic work. While looking the other way as de facto drug cartels like the Sackler family operate freely here, the US government continues to spend billions of dollars on a decades-long “drug war” that has created chaos and caused tens of thousands of deaths in Latin America and the Caribbean. 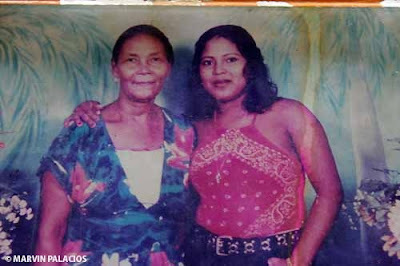 One example is an operation in Honduras five years ago that killed four civilians. Agents of the US Drug Enforcement Administration were involved, and the agency dishonestly and typically blamed the victims—including two pregnant women and a 14-year-old boy. A video obtained by the New York Times reveals the absurdity of the DEA’s claim. Inevitably, thousands of people, including large numbers of children, try to flee here from the crime and violence the US government has created in their own countries. Many of the children have been incarcerated in detention centers and then shipped back home to face more drug-induced violence. This was the policy under the Obama administration, but it’s not good enough for the Trump regime. In September Attorney General Jeff Sessions announced that the kids are “wolves in sheep's clothing” who “prey upon our communities” and “decapitate individuals with machetes, baseball bats and chains.” In response to the supposed problem, the White House wants to make the asylum system even more difficult than it is currently. What is the result of waging a “drug war” in other countries and tolerating drug pushing here by Big Pharma? A Times graph gives us a good idea: the US had less than 10,000 deaths from drug overdoses in 1980; in 2016 the number was more than 59,000. D.E.A. Says Hondurans Opened Fire During a Drug Raid. A Video Suggests Otherwise. “The D.E.A. convinced themselves of a false version of events due to arrogance, false assumptions, and ignorance,” said Tim Rieser, an aide to Senator Patrick J. Leahy. WASHINGTON — The Drug Enforcement Administration has for five years steadfastly defended the behavior of its agents in a late-night drug seizure carried out with Honduran forces on the remote Mosquito Coast, a mission that resulted in the deaths of four Honduran civilians. Neoliberal strictures, support for oligarchs, and the War on Drugs have impoverished millions and destabilized Latin America. 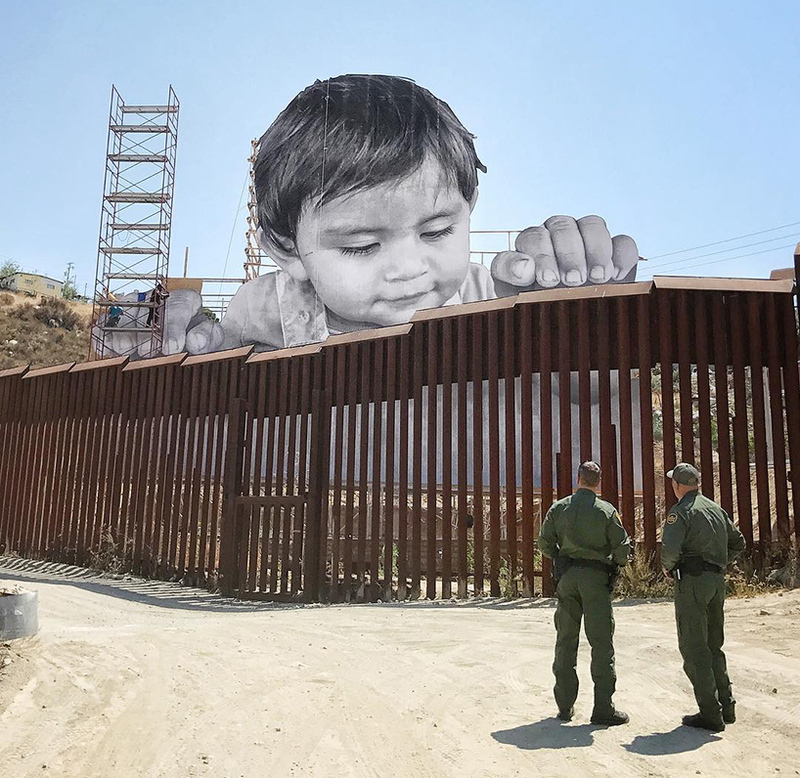 As his price for not deporting roughly 800,000 “Dreamers” who came to this country as children, Donald Trump demands an escalated war against immigrants, topped by his nightmarish 2,000-mile wall along the Mexican border. Democrats have said no. Whether or not some sort of deal is eventually struck, the country will remain deeply divided over undocumented immigrants from the south. 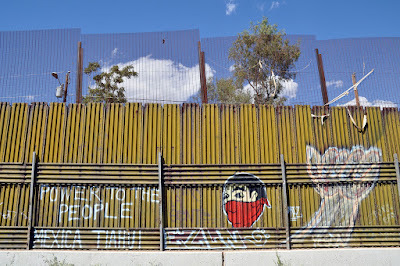 Many of the current misconceptions about immigration were heavily promoted by the corporate media in the past, but establishment outlets have occasionally published sensible articles on the subject recently—especially since Trump entered the White House. The biggest taboo in the immigration debate is the idea of an “amnesty.” Immigration opponents routinely paint amnesties for undocumented immigrants in the United States as catastrophic blows to the rule of law. 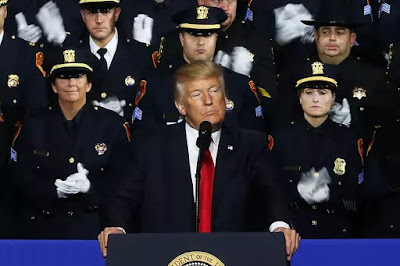 The implication is that the only proper thing to do is enforce laws uniformly, all the time, without exceptions — and that an immigration amnesty would thus be a threat to truth, justice and the American way. My family immigrated here legally. I used to think that made us special. It took travel and time for me to realize how arbitrary and unfair our immigration system is. Amanda Machado is a writer and educator who lives in Oakland, Calif.
During my first year in college, in 2006, I walked across campus one day and found hundreds of white crosses staked on the main green. An immigration activist group had created a mock graveyard to honor people who had died crossing the border. As I passed the demonstration, I felt uncomfortable. Ousting undocumented workers can hurt the economy and put American freedoms at risk. In its zeal to deport unauthorized immigrants, the U.S. risks turning itself into a quasi-police state -- all for little or no benefit to the native-born. A powerful feature article in the Times this week gets across the real suffering of many native-born U.S. workers as their industrial jobs are relocated to Mexico and they are forced into lower-paying service jobs, often in competition with immigrants from Mexico. Deprived of any real analysis of the situation—about the way U.S. trade policy has driven immigration from Mexico, and the way U.S. immigration restrictions force many Mexicans to accept rock-bottom wages in their own country—many displaced U.S. workers have turned to Trump’s nonsensical promises. The hospitality workers union Unite Here was tangling with Donald Trump long before he ever became president. While the business mogul made his run for the Republican nomination last year, the group waged ― and eventually won ― a scrappy battle to unionize the housekeepers and restaurant workers at his hotel on the Las Vegas strip. 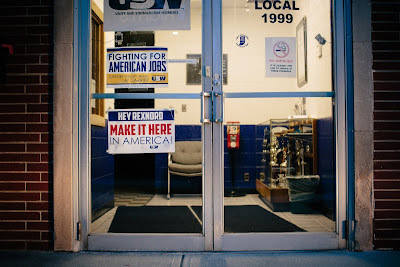 Now that Trump occupies the White House, the union’s president, D. Taylor, says the best place to fight his presidency and his policies is still in the workplace. What’s behind the recent rise in wages for undocumented workers? It could be immigrants’ rights activism. Last Sunday, Trump’s White House released a list of immigration demands that Democrats must meet if they want to renew the Deferred Action for Childhood Arrivals (DACA) program, which has protected hundreds of thousands of young immigrants from deportation. The demands, if met, would mean more criminalization, more surveillance, and more fear for undocumented immigrants. Republicans justify this punitive approach by insisting that immigrants are “taking our jobs,” driving down wages for citizens and making the economic situation more desperate for all. 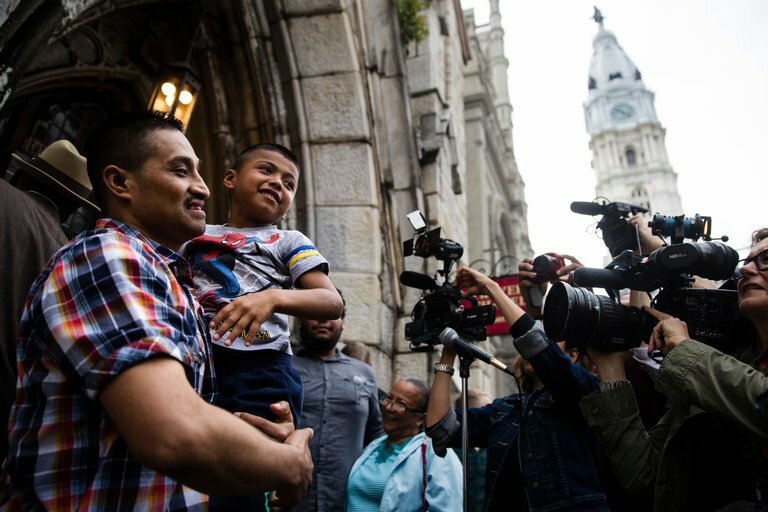 Facing deportation to Mexico and fearing separation from his children, Javier Flores Garcia took refuge last year in a Methodist church in downtown Philadelphia. Members of the congregation prepared a makeshift bedroom for him in the basement, and promised to give him sanctuary, no matter how long he needed it. 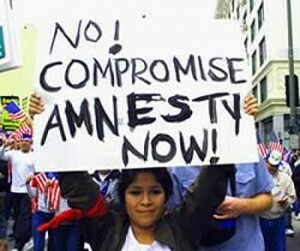 Protect the Dreamers, but Don't Fall for an E-Verify "Compromise"
Liberal commentators have written favorably about the program in the past.... But E-Verify isn't really any better than Trump's "big beautiful wall." E-Verify is back on the political agenda. For the moment media coverage of immigration policy is mostly focused on the whether Trump and the Democrats can make a deal on a new DREAM Act, but some outlets have been reporting on the little-noticed results of Trump policies from earlier in the year. 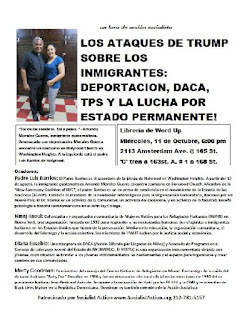 UPDATE, October 17, 2017: The Intercept now reports that then-Homeland Security Secretary John Kelly, currently Trump’s chief of staff, personally directed ICE agents to hype up the “criminality” of the people detained in the February raids. 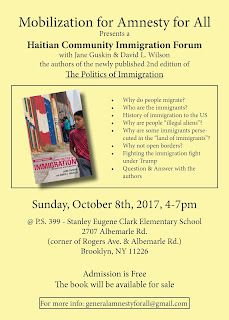 Note: Politics of Immigration co-author David L. Wilson will be signing books at this panel. Ninaj Raoul, co-founder and community organizer at Haitian Women for Haitian Refugees (HWHR) in New York. Diana Eusebio, New York State Youth Leadership Council, the first undocumented youth led organization in New York. Marty Goodman, Socialist Action member and former board member of the Haitian Refugee Center of Miami..
Trump’s “priorities”: restrict asylum, limit family-based legal migration, and build the wall — in exchange for giving legal status, but not citizenship, to 700,000 people. When President Donald Trump announced the end of the Deferred Action for Childhood Arrivals (DACA) program in September, he said he was giving Congress six months to find a legislative solution that would allow the 690,000 young unauthorized immigrants currently protected from deportation under DACA to stay in the country legally. President Donald Trump’s renewed demands for a border wall and dramatic changes to immigration laws in exchange for deportation protections for young undocumented immigrants may help Democrats by keeping the issue alive in the 2018 election year. 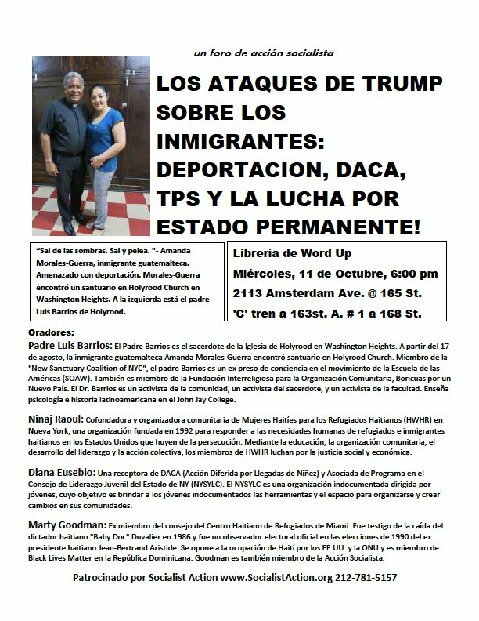 BALTIMORE (October 9, 2017) – The National Association for the Advancement of Colored People (NAACP), America’s oldest social justice organization, released the following statement in response to the immigration principles proposed by the Trump Administration yesterday. This is an urgent call to help save historic Tule Lake. Tule Lake is where more than 24,000 Japanese Americans were imprisoned during World War II. The proposed three-mile-long, eight-feet-high, barbed-wire fence would cut off Japanese American access to the site upon which they and their families were incarcerated. They say a fence is necessary to protect the site from wildlife, but birds are the major form of wildlife at the airport and a fence is ineffective in preventing bird strikes. We have until 5 p.m. on Tuesday, October 10 to write to Modoc County and tell them we oppose the construction of a three-mile-long fence that will close off an airport that sits on two-thirds of the former concentration camp site. Join Mobilization for Amnesty for All this Sunday, October 8, for a book presentation and open discussion with Jane Guskin and David Wilson, the authors of the newly published second edition of the book The Politics of Immigration: Questions and Answers. Why the term “illegal aliens”? Why not just have an open border? 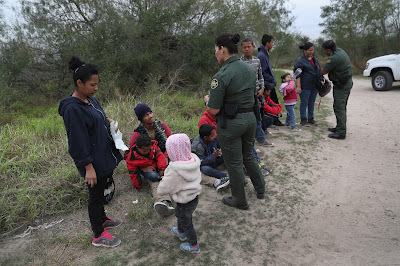 Why are some undocumented and out of status immigrants too afraid to come out of their homes right now and others in similar situations unconcerned? Come with your questions and your contributions. The event is free and the book will be available for sale. Refreshments will be served. Milk with Dignity Agreement Signed! Click here now to donate online! Buy a Migrant Justice "Can't Trump Human Rights" t-shirt today! Just moments ago, farmworker leaders from Migrant Justice and the CEO of Ben & Jerry’s jointly signed the Milk with Dignity agreement. The legally-binding contract establishes Ben & Jerry’s as the first company in the dairy industry to implement the worker-driven human rights program. This momentous occasion marks the beginning of a new day for dairy, one that provides economic relief and support to struggling farm owners, in the form of a premium paid by Ben & Jerry’s, while ensuring dignity and respect for farmworkers. Do you use social media? Help us spread the word about this incredible victory by sharing and retweeting! The agreement has already made it onto the pages of the New York Times! Today’s signing ceremony brings to a close more than two years of public campaigning by dairy workers and their allies, as well as intensive negotiations between Migrant Justice and Ben & Jerry’s. The agreement follows the “Human Rights Can’t Wait” speaking tour -- which brought dairy workers to a dozen cities along the east coast -- and comes just two days before the October 5thNational Day of Action. Migrant Justice is calling off the actions that were to take place at Ben & Jerry’s scoop shops around the country in order to focus on the coming work of implementing this ground-breaking agreement in Ben & Jerry’s supply chain. Ben & Jerry’s implementation of the Milk with Dignity program will result in transformational changes to a troubled industry. Consumers -- thousands of whom have called for this change -- will be able to see their solidarity with farmworkers bear fruit in the form of a major company’s concrete commitment to promoting human rights through worker-driven social responsibility. For more information on how the Milk with Dignity program will work in Ben & Jerry’s supply chain, head over to our website! This watershed moment is only the beginning. As the program rolls out on the farms in Ben & Jerry’s supply chain, dairy workers will be preparing to expand Milk with Dignity to other companies. Your support over the past years was crucial in getting to where we are today -- join us for this next phase in the Milk with Dignity campaign! Thu Oct 5: Tell Ben & Jerry's: Human Rights Can't Wait! UPDATE, October 3, 2017: Ben and Jerry's has signed the agreement and Migrant Justice has called off the National Day of Action. Thanks and congratulations to everyone who supported this effort! Go here for actions in cities other than New York. 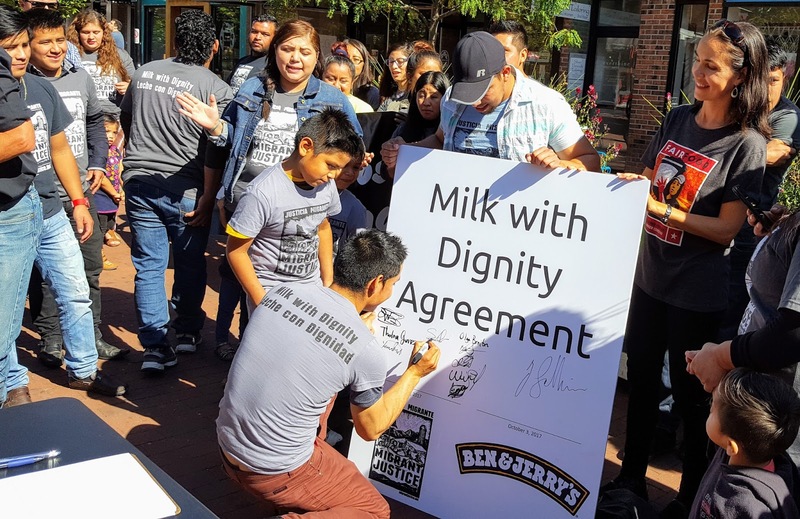 Join us in calling on Ben & Jerry’s to respect the human rights of workers in its dairy supply chain by signing the Milk with Dignity agreement now! This is part of a national day of action on Oct. 5, called by Vermont dairy workers of Migrant Justice / Justicia Migrante (https://migrantjustice.net/) who have been calling on Ben & Jerry’s to ensure protections for workers in its dairy supply chain for nearly three years. Ben & Jerry’s has deferred and deflected on its responsibility to ensure protections for workers in its dairy supply chain. Since 2010, Vermont dairy workers have been educating Ben & Jerry's about serious human rights violations in the industry. In 2014, VT farmworkers called on Ben & Jerry's to join their Milk with Dignity program to ensure respect for farmworker rights its supply chain. In June 2015, after over a dozen actions were planned at its scoop shops across the country, Ben & Jerry's publicly committed to join the Milk with Dignity program. But after two years of talk and no action, hundreds of farmworkers and their allies re-launched the public campaign in spring 2017-- including a historic 13-mile march to Ben & Jerry's Vermont factory in June. Ben & Jerry's CEO welcomed the marchers, assuring the passionate crowd of supporters that Ben & Jerry's is "ready to go.” Nearly two months have passed since then, and Ben & Jerry's has still not made a legally binding commitment to the Program. Únanse con nosotros en hacer el llamado a Ben & Jerry's a respetar los derechos humanos de los trabajadores en su cadena de surtidores de leche en firmar el acuerdo de Leche con Dignidad ahora! Esta acción es parte de un día nacional de acción el 5 de octubre, llamado por los trabajadores de las lecheras de Vermont de Justicia Migrante, que han estado haciendo el llamado a Ben & Jerry's para asegurar protecciones para los trabajadores en su cadena de surtidores por casi tres años. Ben & Jerry's ha retrasado y ha negado su responsabilidad para asegurar protecciones para los trabajadores en su cadena de surtidores de leche. Desde 2010, los trabajadores en las lecheras de Vermont han estado educando a Ben & Jerry's acerca de las violaciones graves de derechos humanos en la industria. En 2014, los trabajadores empezaron a llamar a Ben & Jerry's a unirse con el programa de Leche con Dignidad para asegurar el respeto para los trabajadores en su cadena de surtidores. En junio de 2015, después de que se había planeado más de una docena de acciones fuera de sus tiendas por todo el país, Ben & Jerry's se comprometió publicamente a unirse con el programa de Leche con Dignidad. Pero después de dos años de platicas pero sin acción, cientos de trabajadores y sus aliados lanzaron la campaña pública de nuevo en la primavera de 2017 -- incluyendo una marcha histórica de 13 millas a la fábrica de Ben & Jerry's en Vermont en junio. El CEO de Ben & Jerry's dio la bienvenida a los participantes, asegurando a todos que Ben & Jerry's estaba "listo." Pero casi dos meses han pasado desde entonces, y Ben & Jerry's todavía no ha hecho un compromiso al Programa.